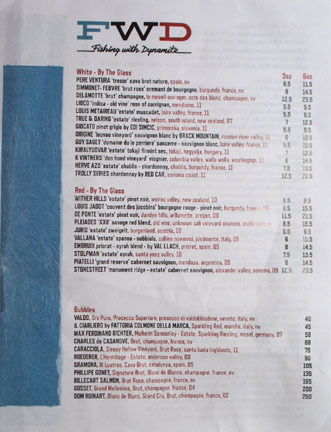 When he debuted MB Post back in 2011, David LeFevre ushered in a new era of dining in Manhattan Beach, providing a glimpse of culinary legitimacy to the oft-derided South Bay. 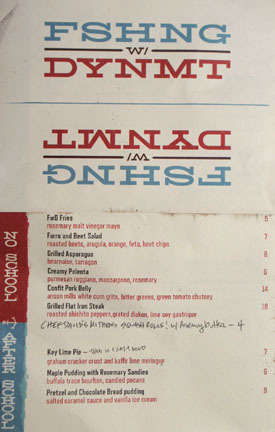 Not surprisingly, given the success of the place, the Chef has followed up with his sophomore effort, the controversially-named Fishing with Dynamite, an East Coast-West Coast seafood joint opened in partnership with the Post's Mike Simms (Tin Roof Bistro, Simmzy's). The concept debuted on April 30th, and makes absolute sense given LeFevre's background. 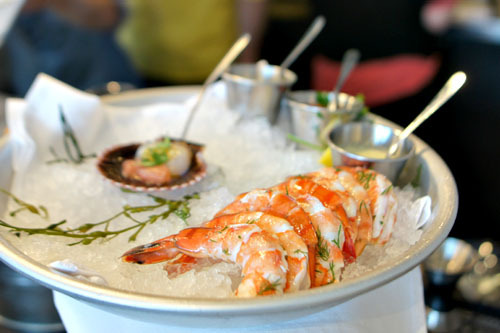 He spent childhood summers on the shores of Virginia, and, of course, was the head chef at Los Angeles' venerable Water Grill for many years (replacing Michael Cimarusti), so seafood is practically in his veins. He is joined here by MB Post Beverage Director Jerry Garbus and Pastry Chef Craig Poirier (of Top Chef: Just Desserts fame), while Jamie Boalbey takes up General Manager duties. FwD occupies the building that once held the longstanding Italian eatery Talia's. The layout remains the same, but the room was revamped by Julie Fisher and Rachel Crowl of FC Studio. The 36-seat, 1,100-sqft space has been whitewashed and decorated with the Chef's own art pieces, and recalls the character of a cozy beachside cottage. 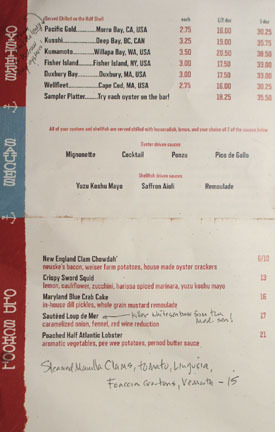 The Fishing with Dynamite menu features a comprehensive raw bar selection in addition to both old- and new-school seafood items, as well as "no school" plates and "after school" desserts. To drink, you'll find a nice array of beers all on draught, as well as a smattering of cocktails as well. Click for larger versions. 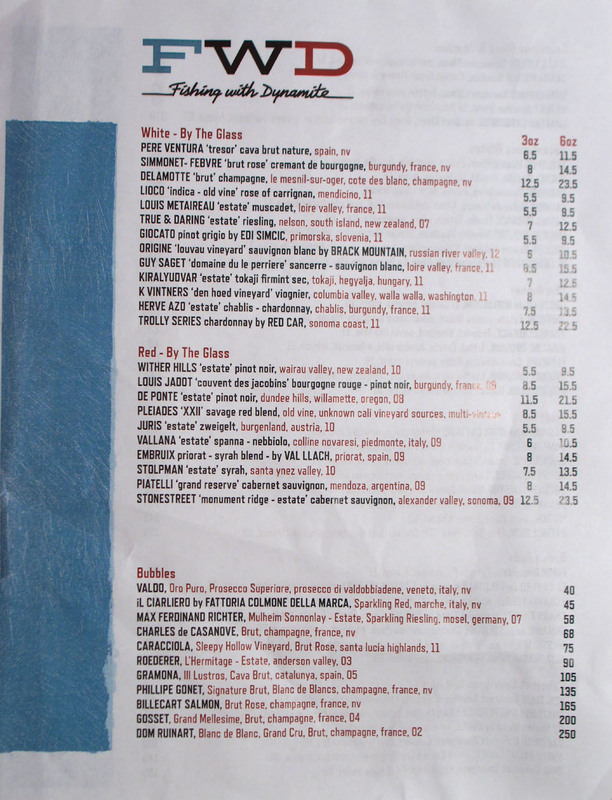 If wine's more your thing, you should be well-served given FwD's surprisingly lengthy list. Click for larger versions. To kick things off, I went with the Regalo de Dios, a sotol-based concoction that came recommended by one of the bartenders. He didn't lead me astray, as it was actually quite nice, with the sweetness of the fruit melding well with the booze, all while the serrano added a prickly undercurrent of heat to things. 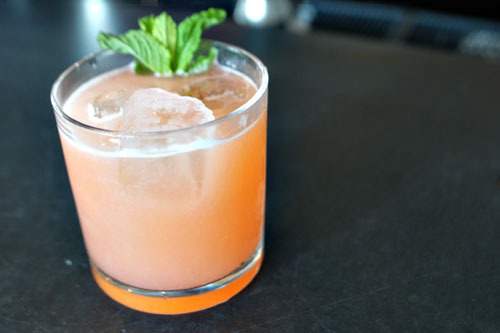 Will sotol be the new mezcal? 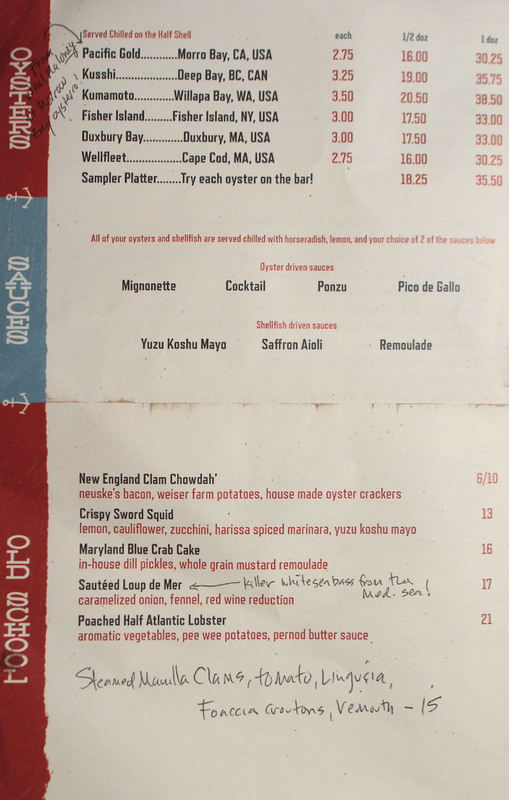 Of course, in a place like this you pretty much have to start with oysters. Keeping with the East-West theme, both coasts were well represented here. 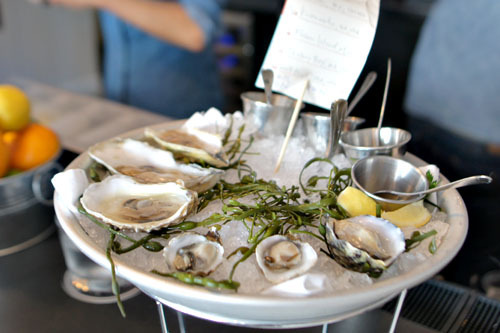 From the West, we had Pacific Gold (Morro Bay, CA), Kusshi (Deep Bay, BC), and Kumamoto (Willapa Bay, WA), while the East Coast was represented by Fisher Island (Fisher Island, NY), Duxbury Bay (Duxbury, MA), and Wellfleet (Cape Cod, MA). 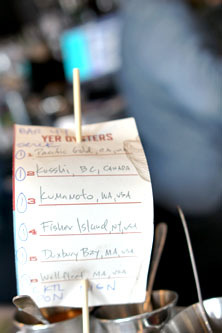 Each oyster was spot on--no shell, no grit, bright, bracing, and full of liquor--and though I'm usually a West Coast kind of guy, the ones from back East made a stellar showing, and in fact, my favorite of the bunch just might've been the Fisher Island. They could all easily stand alone, but the homemade accoutrements were much appreciated as well, with the ponzu and mignonette being particularly enjoyable. I even appreciated the little card they give you with the platter, which ensures you don't forget which oyster is which. Keeping with the raw bar theme, next up were shrimp and scallops. The shrimp were just what you'd expect: cool, sweet, dense, and great with a dab of cocktail sauce (though the yuzukosho mayo made an impression as well). 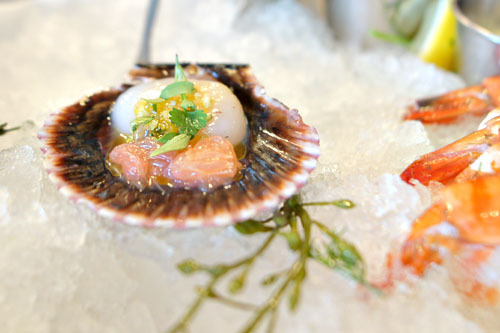 The scallop, meanwhile, was more intriguing, with a bit of citrus that added a lovely acidity and tartness to the mix. 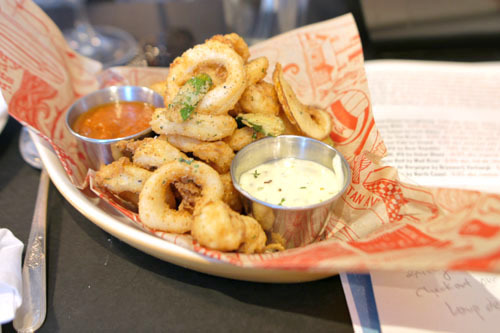 The ubiquitous dish of fried calamari was done proud. 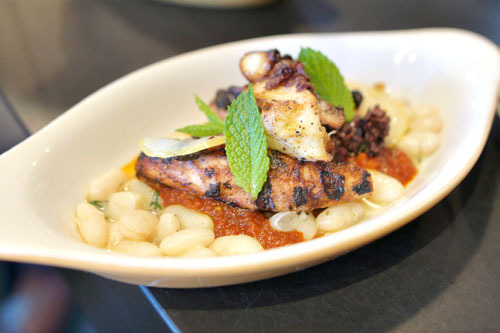 I really appreciated how the squid was so truthfully presented--no overbattering here, with its sweet, saline taste and supple consistency front and center. I enjoyed the rings alone, but the included dipping sauces certainly weren't left untouched either. 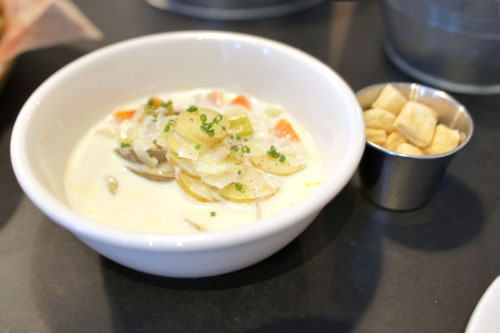 LeFevre's chowder, not surprisingly, reminded me of the one at Water Grill, and that's not a bad thing. It really was one of the tastiest preparations I've had, with a great interplay between the taters and salty bacon, all while the clams added an overarching brininess to the fray. Loved the crunch of the crackers, too. Crab cakes were also very good. 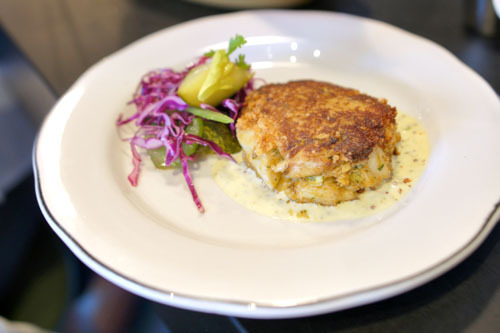 I often complain that there's too much filler in crab cakes, but that wasn't the case here. Instead, the crab meat was deftly presented, conveying a sweet brine that was perked up by the inclusion of mustard. I quite liked the housemade pickles here as well, which added a nice hit of acidity and texture. The octopus, meanwhile, was one of my favorites of the evening. Texturally, it was on point, and I loved the bitterness of the char and how it worked with the octopus' inherent goodness, all while the ragu and tapenade added further points of interest to the flavor profile. The beans were lovely here as well, grounding the dish and adding a palpable heft to things. The next cocktail was advertised as Chef LeFevre's favorite, so naturally I had to give it a go. I can see why, as it really was quite lovely, with a fantastic interplay between the sugariness of the berry and the aromatic nuances from the rosemary and violet. At this point, we transitioned to the new-school portion of the menu. 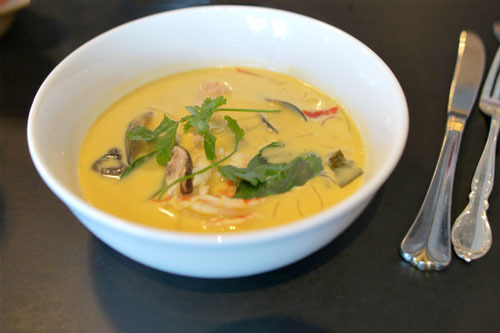 First up was this Thai-inspired soup, which really did a wonderful job in capturing the essence of a tom kha-style potage. 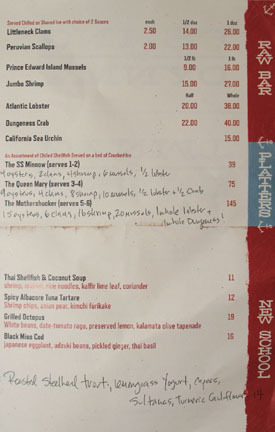 Each item of seafood here was expertly presented, and I loved the aromatic broth, which I eagerly supped up at the end. 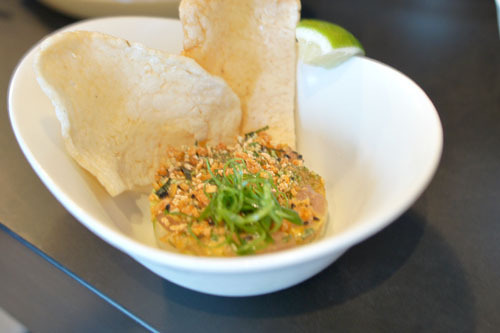 The tuna tartar is perhaps passé at this point, but LeFevre did manage to breathe some new life into the dish by looking towards Asia. The incorporation of furikake offered up a delectably savory, spicy component to the course that really united well with the fish, all while the Asian pear provided brightness, acidity, and crispness. I quite liked the shrimp chips here as well, which were great for scooping up the tartar. 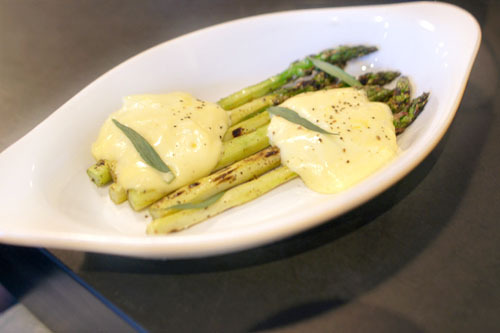 Asparagus was classic in preparation, with the crisp, bitter spears keenly complemented by that creamy Béarnaise. 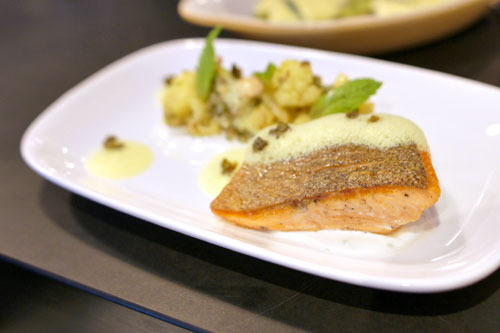 Steelhead arrived beautifully done--moist, flaky, and immensely flavorful--with a delightfully crisp, savory skin. I would've had no problem enjoy the trout all by itself, but the cauliflower imparted a curry-esque flair to the dish that offered up an unexpected counterpoint to the fish. 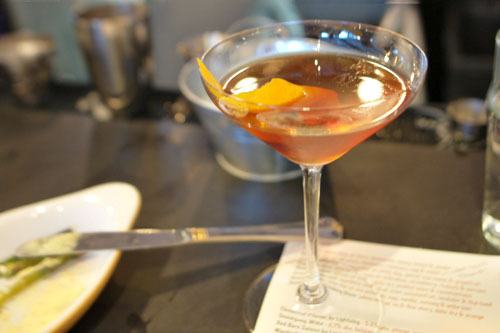 The Original Gangster was the booziest of the cocktails, but much to my liking at the same time, with a fantastic bittersweet component to go against the intensity of the whiskey. Nice! You might be wary of ordering pork at a seafood joint, but then you'd be missing out. As we know from the Post, LeFevre knows his way around meat, and this was some serious belly: tender, yet with a nice crust, and just teeming with porcine goodness. 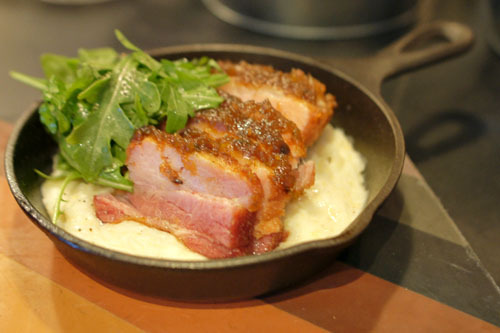 The use of grits couldn't really be faulted, and the greens added a well-placed blast of astringency to the fray. 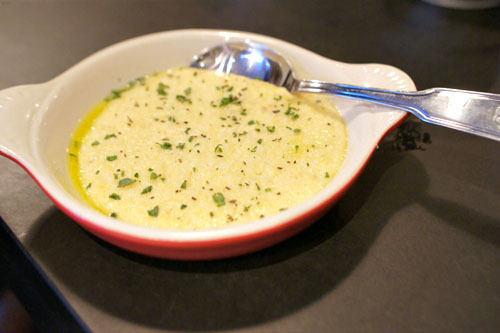 No complaints about the cheesy, creamy polenta either. 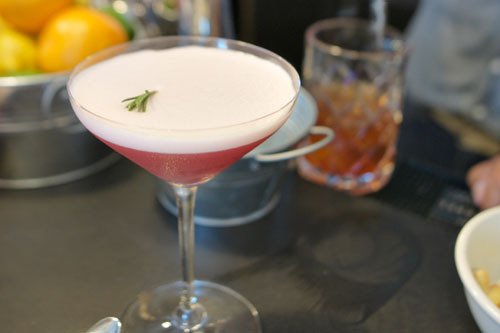 It was a paradigmatic presentation of the dish, heightened by the incorporation of rosemary. 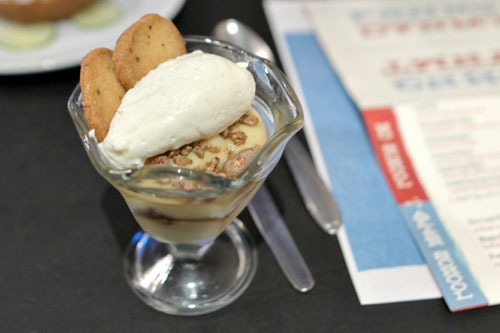 The first of Poirier's desserts was a delightful maple pudding. I reveled in the sheer, sugary heft of the pudding, augmented by some boozy notes from the Buffalo Trace, all while the pecans conveyed a sweet, nutty crunch. And those rosemary sandies? Delish. I kept hearing good things about the key lime pie, but my high hopes were quickly dashed. In the only real misstep of the night, the crust on the pie was ridiculously hard. And by ridiculous, I mean that repeated stabbing motions with the pointy end of a fork weren't even enough to break through it. 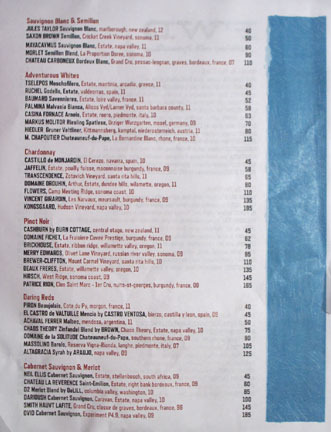 News of this eventually made its way to the Chef (via Patina's Corporate Pastry Chef Carlos Enriquez, who just happened to be dining here this evening), and he ended up 86'ing the dish altogether. A real shame, as the filling and meringue were pretty much spot on. We closed with our favorite of the trio. 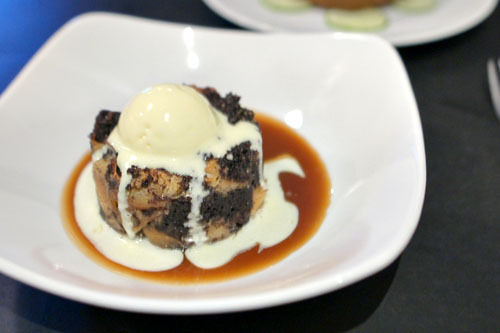 It was a masterful preparation of bread pudding, one of the tastiest I've had no doubt, with a fantastic blend of sweet and savory flavors from the chocolate and pretzel combo that combined flawlessly with the ice cream. Despite being rather stuffed by this point, I just wanted to keep eating. This is the dessert to get. Despite this being only the fifth day of service, Fishing with Dynamite is already humming along just fine. 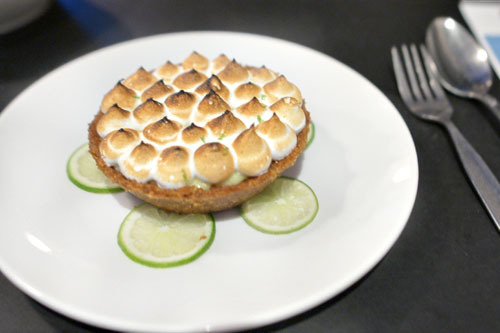 Other than that impenetrable key lime pie, the food really delivered exactly what the Chef promised: an appealing amalgam of old-school and new-school sensibilities that draws inspiration from the East Coast, West Coast, and abroad. It's a smart combination that I think will do very well, and judging from how packed the place was, I'm guessing I'm not the only one who believes that. 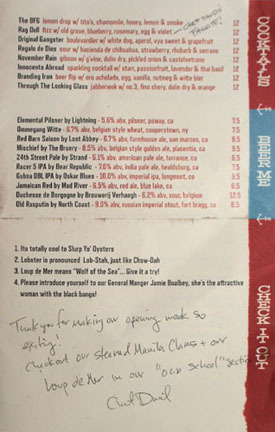 Looks like LeFevre's got another winner on his hands, and for that, the South Bay should be thankful. Everything looks so yum! 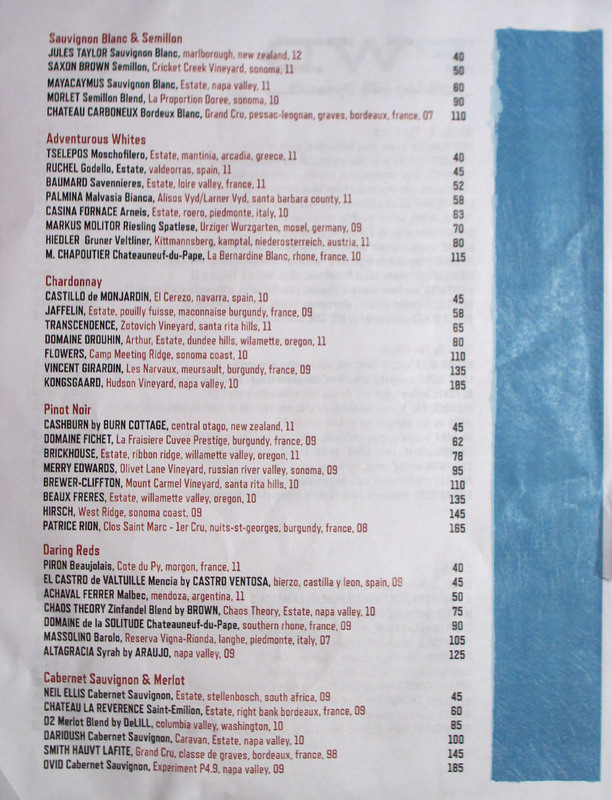 Is there any reputable establishment in the LA/OC area that you have not visited? I envy you!! Wow, I was THIS close to accidentally dining with you (or in the same general vicinity as you, at least). My family tried to get into FWD Sunday but with a relatively large party (6) and a delayed arrival of some members (~5:30 PM) even though others had arrived before opening, they couldn't seat us until at least 7 PM. Why didn't you guys order one of the cold seafood platters? Kim: Many in fact! I don't think I'll ever run out of places to visit. Anon: I was afraid it'd be too much. Offalo: That's one. In the Japanese arena, I'd also add Jinpachi and Kiyokawa, among others. Kevin, that's so strange. I could have swore I read the date as Sunday, May 5th at the top of your post... Must be losing my mind.